This guide will show you just how much it will cost to have various trees removed from your property. 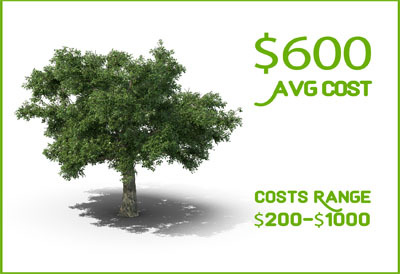 There isn’t an exact way to determine the actual cost to remove your tree without getting a tree service estimate, these are just general costs. For instance, the height of the tree and complexity of the job are pricing factors. Costs may also vary depending on the location and condition of the tree. The average tree removal cost is $650. Tree removal costs range around $150 -$1500. Other types of tree services will be extra. For instance, average stump removal costs range around $60-$350 and average stump grinding costs range from $75-$1000, depending on various factors. Now that you have a bit of a feel for what extras may cost, you may want to know how much it will cost to remove the tree. This depends on the tree. There isn’t a realistic way for a person to remove large trees from their property. You don’t want to do this on your own. One thing to be aware of is that its expensive. The overall cost is based on various factors. If the workers have to climb high and rope down a lot of pieces before felling the tree, the bill will be high. You may end up paying more than $1500 for that service. Some companies may throw in extra services for free, but many companies won’t. If a tree falls on your property, you may want to clear it away as soon as possible. Although it isn’t as risky as removing a healthy tree, it still has a lot of equipment needs and can cause injuries if not careful. The cost to remove a fallen tree is cheaper than a standing tree. This costs between $75-$150. The total price will depend on if you have it hauled away or just chipped/cut up. Oak is a very strong and tough wood. Tree removal for oak is often charged a premium to remove it. They are also quite tall. The average height for a healthy oak tree is 60 feet. You will pay between $200-$1000 to have it removed. Because it is a solid thick wood, the total price is going to be towards the higher end. Ensure that you have a good reason to have it removed before spending a lot of money. There are various types of pine out there, but the average height for a pine is between 40-60 feet. Some varieties may hit 80 feet tall. The total amount you will spend is based on how large the tree is. You may end up paying $200 for a smaller pine and more than $1500 for a larger, taller pine. This is why it is important to get several removal quotes. If you only have to remove a few branches because they are interfering with a power line, call your local utility company. They should fix the issue for free. If you need the branches removed for other reasons, you need to have a tree service remove them. If the branches are small you can do it yourself. If you need to hire a professional, you can be charged an hourly rate. Many companies will charge between $200-$300 hourly. If you have a lot of branches to be cut, it could get expensive. 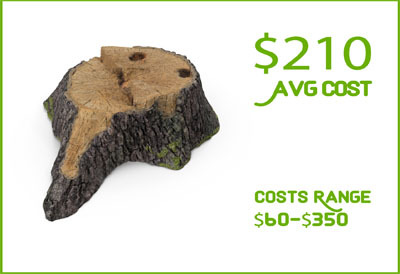 The average stump removal cost is about $205. Stump removal costs range from $60-$350 per stump. Removing stump costs are different based on various things. The cost to remove stumps will depend on if you can do it yourself or hire a professional, as well as other factors. Learning about the costs that are associated with removing the stump, can help you to avoid unwanted surprises. 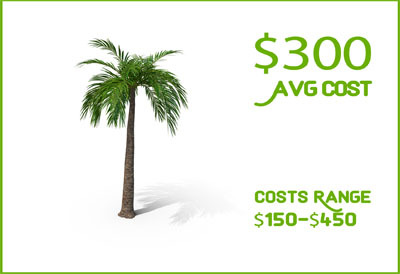 The average palm tree removal cost is about $300. 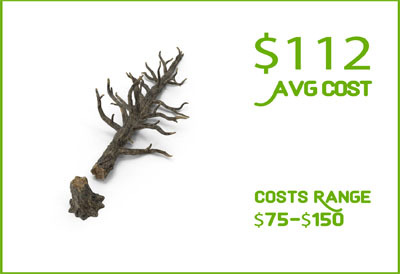 Stump removal costs range from $150-$480 per stump. There are some people that may want more than just basic removal services. For instance, if the price doesn’t include hauling limbs away, you may need to pay extra for that. 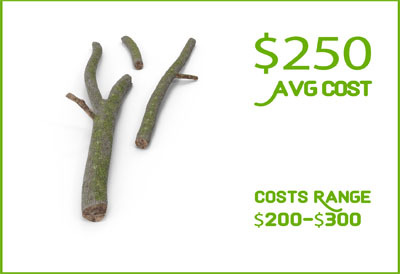 Tree limb removal costs do vary, but the average cost is between $50-$75. Limb chipping: Instead of having the limbs hauled away, you could have them chipped. If the tree service has a chipper available, this shouldn’t cost much. If it isn’t included, you may need to pay about $75 more to have it done. Stump removal: Stump removal is normally not included in tree removal pricing. Unless you plan to pay extra, you will have a stump left. Sometimes, you can get a discounted price to have it removed. Different equipment is needed and it is done by a subcontractor, which is why it could be a costly add-on. The diameter of the stump will help to determine the cost of removing it. You can pay between $60-$350 per stump. If the stump is rotting, it will be cheaper to remove than a healthy and solid stump. Travel expenses: If you live in a rural area and the tree removal service has to travel a long way, you will possibly end up with travel costs as well. This may or may not include drive time. Log splitting: For those who have fireplaces, this is a nice service. If the company offers it, they will bring a log splitter with them. There isn’t a fixed price for this, but it is normally about $75 or more added to your total price. Tree trunk removal: The company should cut your tree trunk into small sections to haul them away, which makes it easier to remove them. If you want them to haul them away, you will most likely pay more. The amount will vary, but it is between $50-$100+ for this service. Location: It is cheaper to remove a tree if it is away from houses and other obstacles. If there are risks for damages, the company may charge more. This is because their liability goes up and they have to be super careful, and use complicated techniques and more complex equipment. Diameter: The diameter of the trunk will play a part in the cost. This also comes into place for stump grinding. 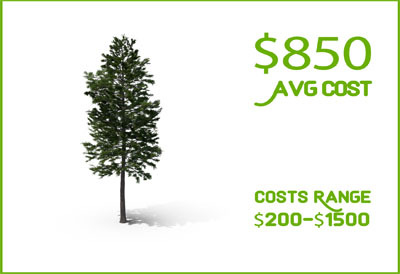 You could pay more for a shorter, thicker tree than a taller slim tree. Condition: If the tree is strong and healthy, you may pay more. If it is rotting, dead, or dying, it would be easier to remove and results in lower costs. If you aren’t offered a reasonable price, make sure that you point out that the tree is weak. Size: The height of the tree is one of the most critical cost factors. After high winds or major storms, the tree may crash and cause damage to objects or your home. Tree removal services may charge more for removing these types of trees. The reason for the higher price is because they have to be careful that they do not cause any more damage to the property. Not to mention that damage trees have more risks in general as workers can be injured. Even though it may seem to be a major expense to have a tree safely removed by a professional, it is well worth the money. When you let a professional handle it for you, you are able to avoid any serious injuries to yourself as well as avoid other types of issues. Removing a tree is not an easy job. Why not let a professional handle it for you? Various services are offered when removing trees, but basic services are normally included. The tree will need to be cut down. Normally, the contractor will rope down pieces of the tree by climbing and cutting the tree into manageable pieces. For some cases, it could be hauled away for free, or it will be included in your estimate. For more considerations, look at the complete guide to know what questions to ask about when looking for tree removal services. In order to keep your yard looking as great as possible, you may need to have trees trimmed and put into shape. Additionally, making a tree look better for the eyes, pruning or trimming may be used to remove broken or dead limbs that can pose a serious issue. The cost for tree trimming will vary, depending on various factors, including whether or not that you can do it yourself or if you need to hire a professional contractor to do it for you. Learn more with the Tree Trimming Cost Guide. If you need tree removal services anywhere in the Phoenix Valley, give Arbor Care a call today at (480) 797-5566 or receive a free tree removal estimate in Phoenix. Our Service area includes: Phoenix, Tempe, Chandler, Gilbert, Mesa, Tempe, Scottsdale, Glendale, Peoria, and Surprise, Arizona. Since we do our work in Michigan, I find it very interesting that it is so cheap to remove a palm tree compared to trees found more locally for us. Great article!! I am looking to have a tree topped and the lower half trimmed.